If you are looking for information on the Gorilla Games franchise business opportunity, Gorilla Games franchises or Gorilla Games franchising, then you have come to the right place. Gorilla Games offers the only Trademark Business License program in the video game industry! We also offer Great Support, Low Investment, Reduced Expenses and No Royalties. We will give you complete training and business solutions packages. Gorilla Games positions you to out-perform any franchise video game store. Your stores will be more profitable than a typical gaming store franchise and Licensing is available in both the US and Canada! Why own a Trademark Gaming Store License with Gorilla Games? Be Different-recognition and appreciation of the key elements needed to operate a successful business. Not your typical franchise - A typical franchise requires that you pay a percent of your sales, pay for local and national advertising, pay for every change they make to displays, but not us! Options instead of demands - choose from the optional programs we offer and maximize your income. Entrepreneurship - Our business and operations model is designed around a complete business package. Our proprietary management tools provide critical real time metrics necessary to manage each of your Gorilla Games stores. Differentiate Yourself - As a licensee, you get to keep the royalties you would pay a franchiser. You are not handcuffed to programs that do not fit your market or business plans. 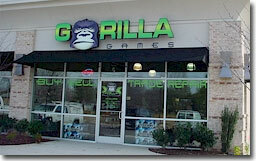 The benefits of a Gorilla Games Store include having a tested operating system, initial and advanced training for management and staff, operations manual, marketing and advertising programs, site selection tools, store design and construction programs, reduced cost of equipment and other necessary support required to successfully launch your business. The best part is you can pick and choose which programs you need. Additionally Gorilla Games Stores have an experienced partner and the network of other stores to call on for advice.